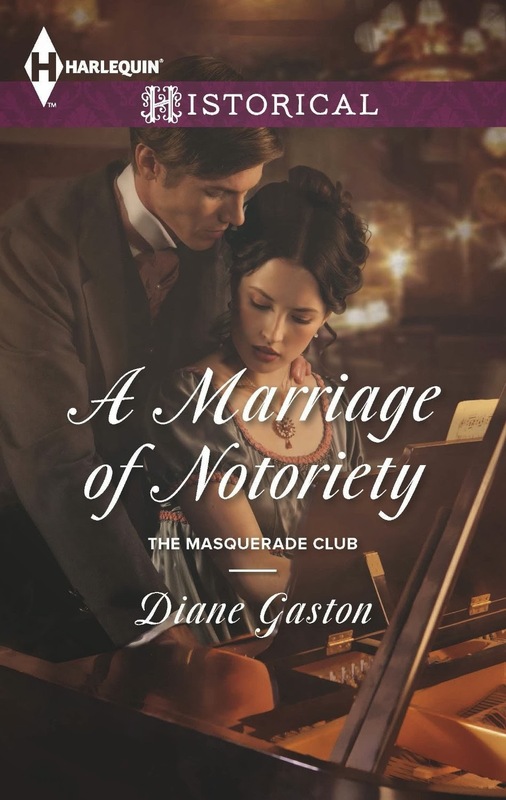 I’ve been a fan of Diane Gaston’s books since she first appeared on the romance scene. Her book THE MYSTERIOUS MISS M captivated me from page one to the end. The same is true for her latest book A MARRIAGE OF NOTORIETY. Simply put, it’s a marriage of convenience story. Sign me up! I love it when two seemingly opposite people must marry to save a reputation or secure one. So I settled into my comfortable corner of the couch and dug in. But this was so much more than that. It features a tortured main character. Usually tortured main characters are male and have a host of issues that made them into the hero that they are. Another one of my favorite plot devices. Here’s the first of Diane Gaston’s delightful twists. The tortured soul is not the hero of the story but the heroine. Hello? What do we have here? We have a great story of a young lady, Lady Phillipa, whose beauty is marred by a scar at a very tender and vulnerable age. The scar runs as deeply on her cheek as within her spirit. Back into her life walks a friend from her childhood who knew her before her accident, Xavier or as society dubbed him, Adonis. Her own insecurities blind her to his genuine and real interest in her. How can one of such beauty want anything to do with a beast like herself? This hero can and he turns to making her see that her scar is of no consequence to him. He becomes her champion. Her ramshackle family disappoints from the very beginning of the story. They keep some pretty significant secrets from her like the fact that her father's recently acknowledged illegitimate son runs a gambling house financed by her own brothers. Xavier is helping her half brother run the establishment. They also keep from her the fact that her father has been exiled to the continent for bringing the family perilously close to ruin financially and wanting to duel his own son. Nice crowd, right? Xavier is the only one who is completely honest with her about all of this. She decides to play at the gambling house with Xavier’s full knowledge. He escorts her to and from the gambling house in an effort to spend more time with her. It is the beauty who begins to fall in love first. It is only when her brothers return and see Xavier out with her so very late into the night that things get complicated. She is going to be ruined if Xavier does not marry her. And being the champion that he is, they wed. YAY! A marriage of convenience story! LOVE IT! Diane Gaston has always had a knack for keeping you involved and invested in a story. The love that is allowed to blossom between Xavier and Phillipa is a delight. So sweet and tender. They have their challenges. They have some pretty unsavory characters that look to bring down their relationship and it is a vulnerable, tenuous relationship at first. Most of this is due to our heroine’s insecurities and issues with what she continues to see as a mark against her. But Gaston writes their story true to their characters and soon, they too have their own happily ever after. I really enjoyed reading A MARRIAGE OF NOTORIETY. I am new to this series so I will be picking up the first book in the series and the next. And with Diane Gaston, more likely as not, every other book she puts to paper or e-reader. She continues to be that good! I share your fondness of historicals, regencygirl. Harlequin puts out some good ones! Santa, thank you for the review. I like marriage of convenience stories....that's why I read any Betty Neels book I could get my hands on when I was a young teen and young woman. (And, I have every single one of her books except 2!). This story sounds so lovely and heart-warming. Yay, a hero that is interested in the heroine right away. I am definitely adding this one to my TBR pile. Thanks. I love marriage of convenience stories! :) Will have to give this one a try! I've enjoyed her books in the past and this sounds like another good one - thanks. I started following the Risky Regencies Blog (www.riskyregencies.com) several years ago and Diane Gaston is my favorite of their members. They are currently having a $.99 sale, but unfortunately, none of Diane's books are included. Her books always have well developed characters and a bit of a different twist to the story. I have not yet read this one, but I will be looking for it. Thanks for the review. I have always enjoyed Diane's books. I'll be putting this series on my TRL. Thanks for the review. I also enjoy reading Diane Gason's books and I'm adding this to my Wish List. Thanks for the heads-up!